He knew he didn't have much time left. His family knew it. His hospice care team knew it, too. 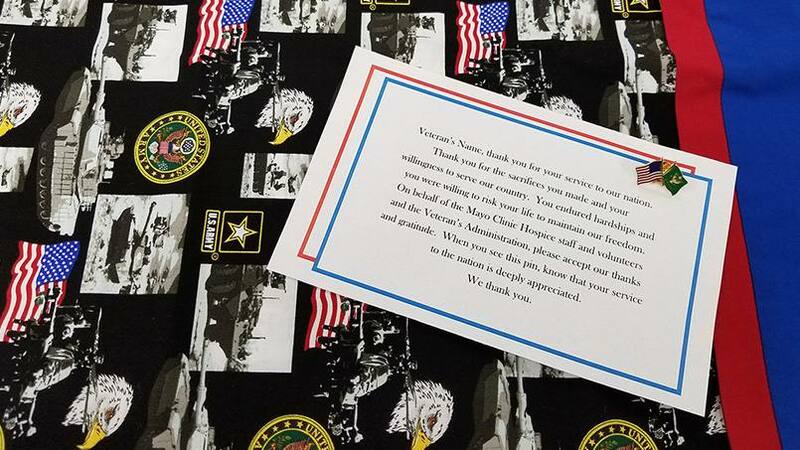 So after learning their patient was a veteran, one of the Mayo Clinic Hospice team members asked if he would like to have a brief ceremony to recognize his military service. He agreed and a ceremony was arranged for that same day. The patient was alert as he and his family waited in his hospital room. Members of the Veterans Mayo Employee Resource Group arrived to perform the ceremony. First came introductions. Next, a family member fastened two pins — the American flag and the patient's branch of service — onto his clothing. The patient was then presented with a branch-specific pillowcase made by Mayo Clinic's team of hospice volunteers. Then a member of the Mayo veterans group read and presented the patient with a framed certificate that thanked him for service to his country. Next would come a final salute by the assembled Veterans Mayo Employee Resource Group members. But as the words of gratitude were read, the man's breathing slowed, and he passed away in their presence. 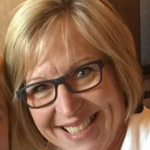 "That was so powerful because we knew he'd been hanging on for this," Amy Stelpflug, volunteer coordinator for Mayo Clinic's Hospice program, tells us. "There was a peace that was brought upon him in that room at that moment, and it was really powerful to be a part of it." While not every pinning ceremony is that dramatic, each one offered to hospice patients through the We Honor Veterans program is carried out with the same intent: to honor and recognize a patient's service to our country and help them find closure and peace as they near the end of their life. "By and large, service members will usually have a more difficult type of death," Kelley Adelsman, bereavement coordinator for Mayo Clinic's Hospice program, and military veteran herself, tells us. "I've talked with veterans who've said, 'I know things that I've never been able to tell anyone, and I'm going to die with these secrets.' And so the We Honor Veterans program was created to help them with doing that." The program gives patients the opportunity to talk about their military service during the pinning ceremonies with fellow veterans. Veterans like Mayo Clinic staff members Keith Trepanier and Michael Zaccariello, Ph.D., who tell us this is far and away their favorite part of the ceremonies. "We get feedback from the patients' families that they're oftentimes hearing these stories for the first time," Dr. Zaccariello, a clinical psychologist in the U.S. Army Reserves, tells us. "The families often attribute that to having another military veteran in the room." Trepanier, a 25-year military vet and Mayo Clinic Medical Transport's aviation safety manager, tells us another important part of the pinning ceremonies is that they often represent the first time that these patients are recognized and thanked for their military service. "It doesn't matter if you spent one year or a lifetime in the military, to have someone honor you specifically for that service means a lot," he says. You can read more about the We Honor Veterans program here. Then, honor us by leaving a comment below before using the handy social media tools atop this page to share this story with others. Learn more about Mayo Clinic's Hospice services. Read about Veterans Mayo Employee Resource Group. While this story made me cry, it is so uplifting to know this wonderful program exists for our Veterans. Thank you for the program and for sharing this story. Our family had the privilege of this program honoring my father just two weeks before his death. We heard military stories for the first time as Dad shared them with the vets who visited. He talked about it every day until he left us and we now get to cherish the honorable gifts. There aren’t enough good word or ways to say thanks to Mayo Clinic Hospice and We Honor Veterans.